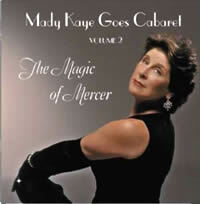 Mady Kaye Goes Cabaret – The Magic of Mercer! Mady Kaye first presented this original show at Zachary Scott Theater in Austin, TX in 2005, as part of the Z-Cabaret Concert Series. The show was a hit, and featured favorites from the Johnny Mercer songbook as well as stories about his life. Mady Kaye weaves her usual magic in these lush interpretations of Mercer classics, revealing the emotional heart of the song. At times understated, at times over-the-top, Ms. Kaye’s storytelling is masterful and spellbinding. This is a singer who knows her subject, and she tells it as if she just happened to be at one of those famous Hollywood parties of the 1940’s. Pure listening joy! 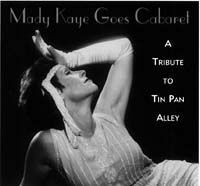 Mady Kaye Goes Cabaret: A Tribute to Tin Pan Alley is Ms. Kaye’s hugely successful venture into cabaret. The show highlights the “Golden Age of Song,” the years between 1920 and 1940 in which “Tin Pan Alley” – the music publishing industry – burst upon the New York scene. Through songs and stories, we relive the history and heartbreak, the romance and humor of those wonderful years in American popular music, years that brought us Cole Porter, Rodgers & Hart, Irving Berlin and of course, the Gershwins. The Cabaret show was presented at Zachary Scott Theater, Austin, in August 1999 to sold-out houses. The CD, recorded during two nights of the run, makes you, the listener, feel as though you are sitting in the audience. It’s up close and personal. The songs are sublime. The singing is lovely. The text is smart and snappy. Just what you’d expect from Mady Kaye. Mady Kaye’s passion for song finds its expression on Songs for All Seasons , her first CD and debut as a songwriter. This is Mady Kaye at her best. Her original lyrics are witty and highly stylish, as on Charlie Parker’s “Au Privave” or her own “So Hot.” On “Autumn Song” the lyric is poignant and bittersweet, lingering in the ear like fine wine on the palate. Ms. Kaye’s voice is smooth and very clear, her diction bitingly concise. But it is her phrasing that is inspired, whether applied to standards or to her own material. Her feel for the inner rhythm of the line is unerring. In live performance Ms. Kaye frequently improvises new verses to jazz classics, with a nod to the author’s intent and inner rhyme, resulting in a song that would delight even Cole Porter or Ira Gershwin. In local record store, Waterloo Records, Lamar at 5th. Allow two to three weeks for delivery of CD. All product is shrink-wrapped at factory and in perfect condition when sent. Any defective product will be replaced free of charge (except for shipping cost) if you return defective product within two weeks of receiving it. Other than that, there are no replacements or refunds.